This three hour modern day tour takes guests to some of the most picturesque and famous locations within the Waikiki and Honolulu area. Multiple photo opportunities and scenic views! Touring has never been so much fun! Enjoy the incredible sights of Waikiki and famous Magic Island Beach on this guided small group tour. 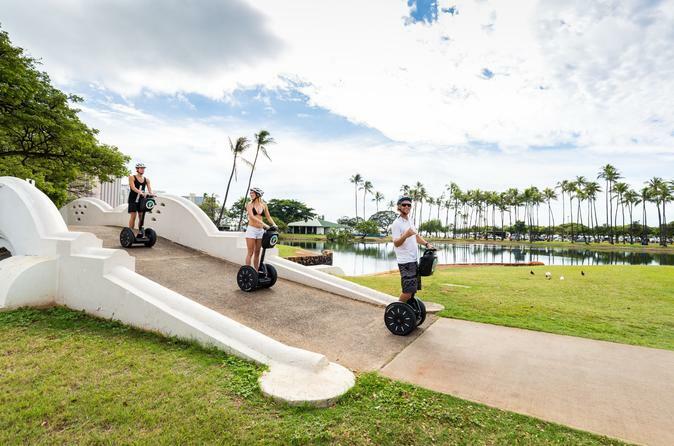 After an introduction on your Segway at our base location, our guide will lead you to Hilton Lagoon at the world- famous Hilton Hotel. Now your tour begins! First your guide will share history of Hawaii as it relates to the area including fun, pop-culture facts and stories. The peninsula that is Magic Island was constructed in 1964 to be the location of a luxury resort complex. The land was literally reclaimed from the sea by building atop a shallow reef. The resort was never built and the newly-created land was re-purposed as a public park. Here there are amazing photo opportunities and beautiful oceanscapes. Take in the true beauty of Oahu. Famous Ala Wai Boat Harbor, Kaka‘ako Waterfront Park and the hip, trendy town of Kaka‘ako itself along with famous surf spots. All in all an amazing and fun way to see and learn about Hawaii!